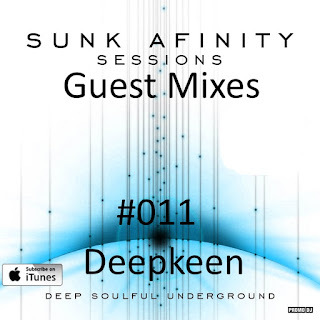 They say life begins 40, not to sure about that personally, however the deep vibes are strong in the 40th episode of the Sunk Afinity Sessions! First track from two amazing ladies I'm lucky enough to know.. Miss Luna and Rescue Poetix - Chances (Divided Souls & Samuri Remix). Two excellent as always tracks from Rishi K and new stuff from San Soda, Jazzmatik.... Enjoy the show and thanks for listening. Episode 39 featuring two excellent releases back to back from House HED Music, new vibrations from Joss Moog, Todd Terry and a mountain more deep house hotness. All tracks in this and all other sessions are available for purchase on www.traxsource.com support the artists hard work! Sunk Afinity Sessions Guest Mixes #09 Victor Simonelli by Japhet Be on Mixcloud Download and Stream Links..
Sunk Afinity Sessions Episode 38Excellent new music with huge amounts deep energy in this episode. Enjoy the music and thanks for listening! 1.Afrospirit byIvan Latyshev 2.After We're Gone (Higher Power Dub) byWolf + Lamb 3.Stein's Way byJonathan Kusuma 4.Down The Road (Loz Goddard Mix) bySoul Minority, Loz Goddard 5.Catch Up byNachtbraker 6.War (Original Mix) byDelgado 7.Heart Glorious (Original Mix) byRené 8.Swoosh (Original MIx) byJero Nougues 9.A Little Bit More byJoyfull Family 10.Mold (Original Mix) byKocleo Download and Stream Links..